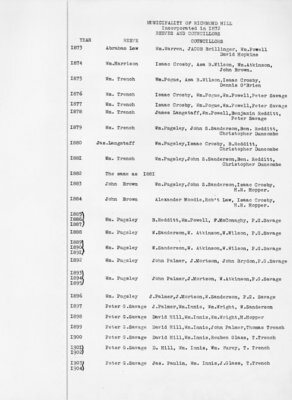 A list of Reeves and Councillors of the municipality of Richmond Hill from 1873 to 1951. 1906	Isaac Crosby	Hesse Nicholls, W.Sanderson, J.P.Glass, T.Trench. 1929	Jacob Lunau	Henry Davis, A.Chapman, W.Middleton, Prank Sims. 1930	Jacob Lunau	H.Davis, A.Chapman, W. Middleton, Prank Sims. 1931	Jacob Lunau	Harold Mills, J.Monkman, Jas.McLean, D. Hill. 1932	Jacob Lunau	H.Mills, J.Monkman, J.Greene, D. Hill. 1938	J.A.Greene	H.Mills, A.Little, P.C.Hill, Christian Nelson. 1939	J.A.Greene	H.Mills, A.Little, P.C.Hill, Christian Nelson.